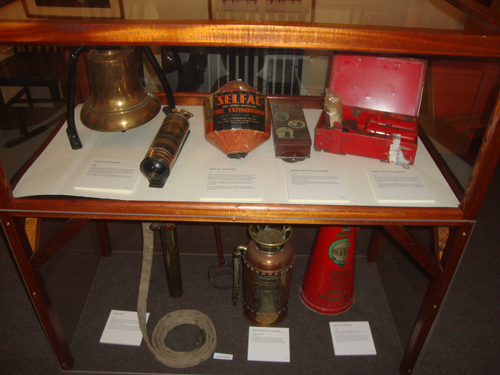 Although a London Fire Brigade as we would recognise it was first set up in the mid-19th Century, the museum gives us the history of fire and London from the earliest days. 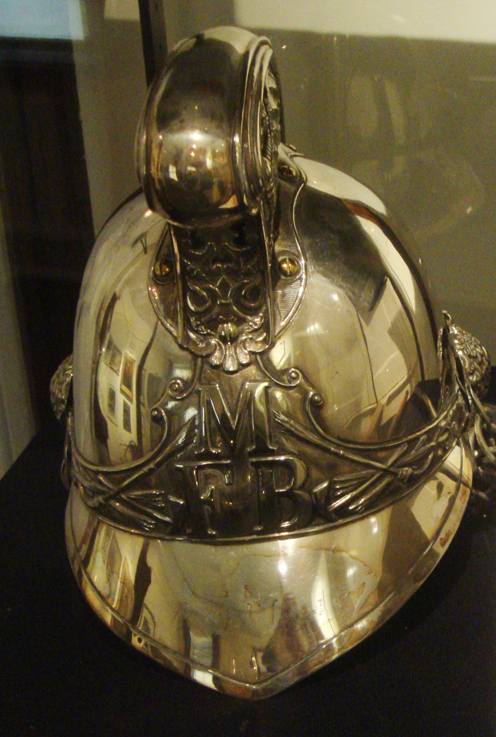 The Great Fire will always be seared in Londoners’ minds as the major biggie from those times. 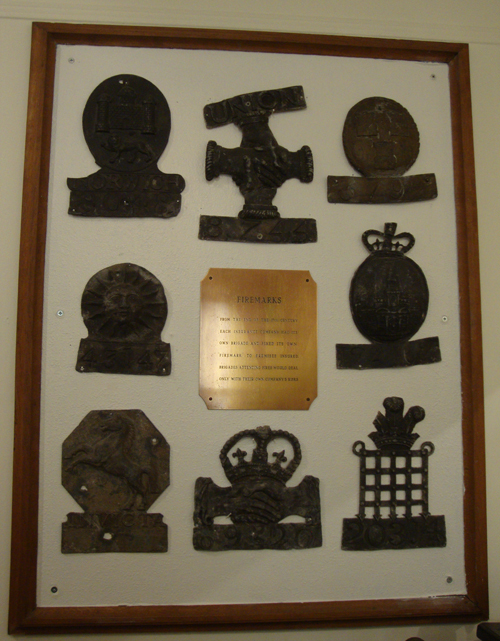 Its aftermath saw the establishment and rapid growth of fire insurance and the museum has a wonderful collection of fire insurance badges. 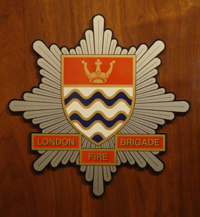 If your property caught fire without that badge, you were on your own! 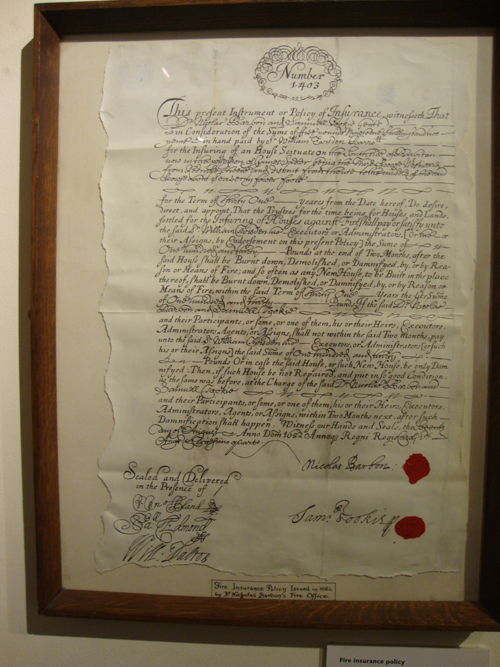 Late 17C fire insurance policy, signed by notorious projector Nicolas Barbon. Both these men’s lives and careers are well covered in the museum. 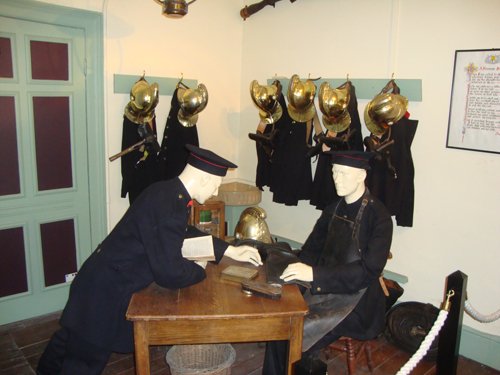 In addition you’ll find out much about the development of fire-fighting technology, clothing, appliances, training, communications. 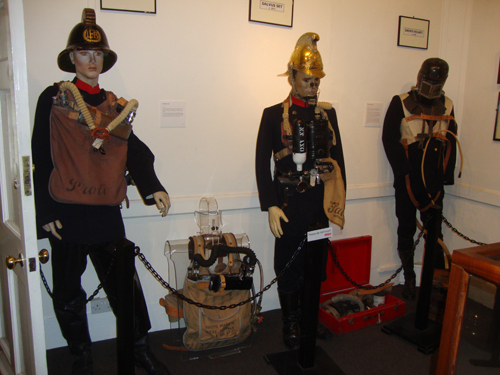 I was amazed to find that firemen were using rebreather sets in 1913, this was something I thought was the exclusive province of modern scuba divers! 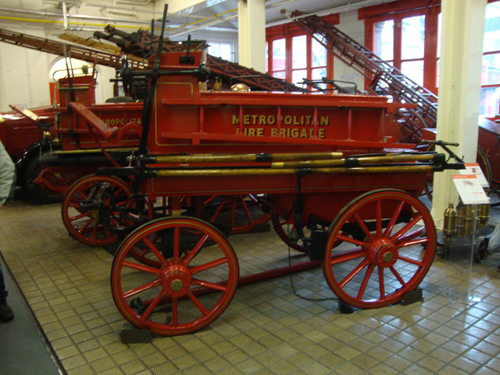 You’ll be reminded of the Brigade’s finest hour: The Blitz. It’s all fascinating stuff. 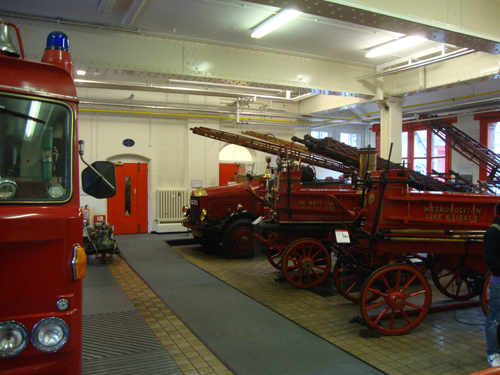 The large items – that is to say fire engines – are housed in the next door building. It’s a fine collection. In every room there are racks with very smart hand-outs that you can take home with you. And I did. I imagine it takes a lot of effort to produce these and keep the stock levels. I’d suggest not many museums could bother with the hassle. Over the past year there has been much talk (that I was unaware of) about closing this fine museum. We asked staff what the latest was, but they had to take a diplomatic “no comment” position: for them it’s awkward. Losing this wonderful facility would be a tragic travesty. Do acquaint yourself with the situation using this search. Breaking News: Amazing timing, announcement just today that the museum is to remain open. Whatever the future holds for the museum, I’d recommend you visit as soon as possible. All visits are by appointment and all are part of a guided tour. Cost is £5 for adults with discounts for groups. All information here.